Thank you to Alyson for awarding me this fabulous award. The conditions of this award are I must thank who gave me it and link to their blog - done. 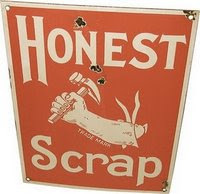 I must put a copy of the honest scrap logo on my page - done. I must select at least 7 other worthy bloggers for this award (this part will be hard Im not sure I know 7 other bloggers lol) and notify them of the award. All other friends have had one or more nominations already lol So Im stuck for other names. Sorry Folks but I guess 4 is better than none. Love your ten honest things - but sorry you're feeling sad today. OMG a ga gal come on whose ya fav?